Top business and civic leaders recently paid tribute to Epoch 5 President Katherine Heaviside, and other innovators who have had a lasting, positive impact on the region, at the inaugural induction ceremony of the Long Island Business Hall of Fame. “These men and women are visionaries whose contributions have touched lives all across our Island,” said Long Island Business News Editor Joe Dowd. “Each has consistently demonstrated remarkable and impactful leadership skills and a commitment to excellence.” Suffolk County Executive Steve Bellone and Nassau County Executive Edward Mangano were the keynote speakers. Named a New York State Woman of Distinction, Heaviside is a member of numerous boards, including the executive board of the Long Island Association, the region’s largest business organization. The firm she founded over three decades ago, Epoch 5 Public Relations, is consistently named “Best PR Firm” on Long Island for its public relations and issues management services. Among its clients are some of the area’s largest businesses, including Bethpage Federal Credit Union, King Kullen, Purolator International, Transdev (NICE bus), and Cablevision. 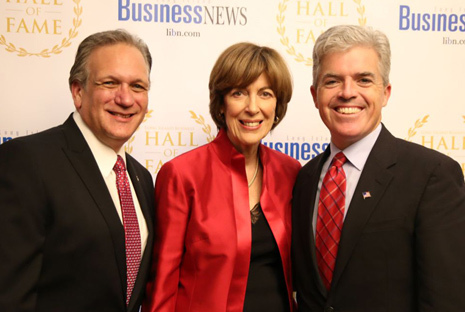 Nassau County Executive Ed Mangano and Suffolk County Executive Steve Bellone congratulate Katherine on her selection to the business hall of fame.